Information on the September full moon esbat. Enjoy! 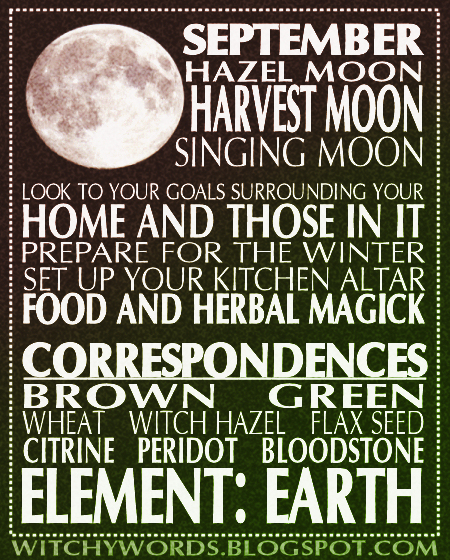 Do you recommend any rituals or meditations for the harvest moon tonight? If it is already on your blog page somewhere, please point me in the direction! Thank you!! Because this esbat centers around your home and kitchen, it can be difficult to incorporate that into your circle. For my Circle, we created pouches filled with prosperity herbs to place later on our kitchen altars. You could also look into protection or cleansing spells and herbs for your home. As for meditation, try getting the whole family or a group of your friends together for a group meditation in your own home. Meditating on a specific thought pertaining to your home and family could also be useful. Best of luck! Thanks so much Marietta, will do!